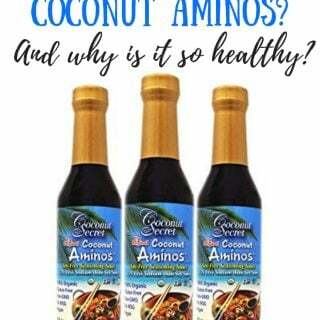 This post contains affiliate links for products I am obsessed with. Thank you for your support! My favorite Christmas present came shortly after black Friday. I totally bought it for myself, too, because it looks way too much like another Slow Cooker and I knew my husband wouldn’t get it, as I have three Slow Cookers currently. I even tried to talk myself out of it. I really did. But, in the end, I am SO thankful for Amazon Prime’s Click to Buy because I am truly in love with this pot. And, if you follow me on Facebook, you will see that I bravely went LIVE with my first attempt at cooking with the IP. 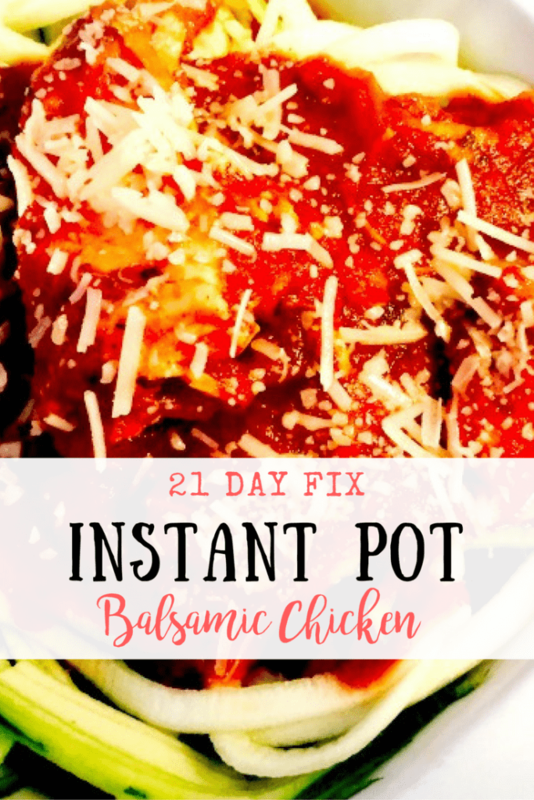 I decided to try one of my favorite Slow Cooker Recipes – Balasmic Chicken with Zoodles – in the Instant Pot and it was a huge success. Here was my “after” video! Although I am slightly mortified by these videos (can someone come do my hair and makeup next time? ), and I was actually sick with bronchitis and a sinus infection, I am happy I filmed them because I think there is a lot of fear surrounding pressure cookers, but I really found this one to be so easy to use! And my chicken was done in less than ten minutes, plus the time it tool to come to pressure. My favorite feature of the Instant Pot is the Saute function because you truly don’t need to use your stove top at all. Nothing bums me out more than a Crock Pot recipe that calls for 30 minutes of stove top cooking first. I mean, what’s the point? And so for this Instant Pot Balsamic Chicken I was able to saute these pretty red onions before dumping the rest of the ingredients in. This also serves to heat the pot a bit, which lessens the amount of time it takes to come to pressure. Which for this took about 15 minutes. I should also note that this bad boy makes yogurt and can also double as a slow cooker, although I haven’t tried either yet. I realize it doesn’t look like much, but WOW. 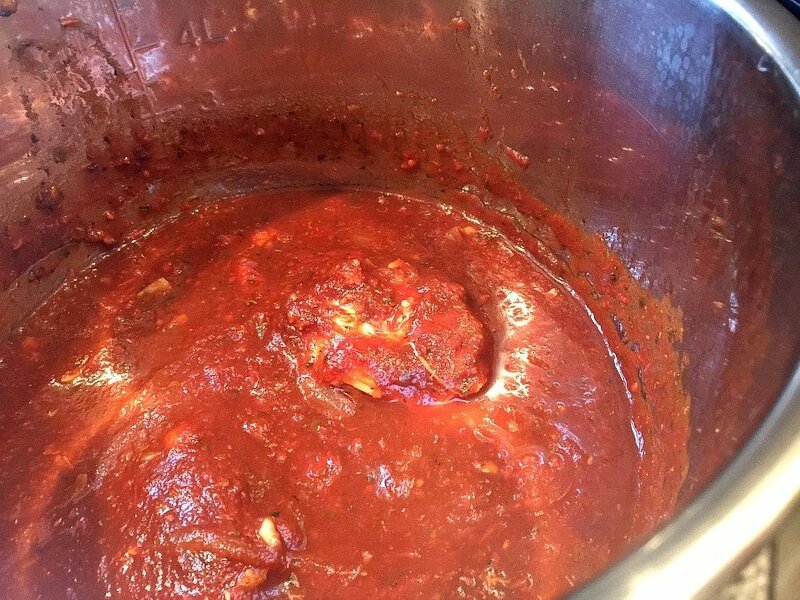 The flavor of this dinner was incredible…and it retained more of the sauce than when I cook it all day in the crock. This was a HUGE hit with my husband, too. 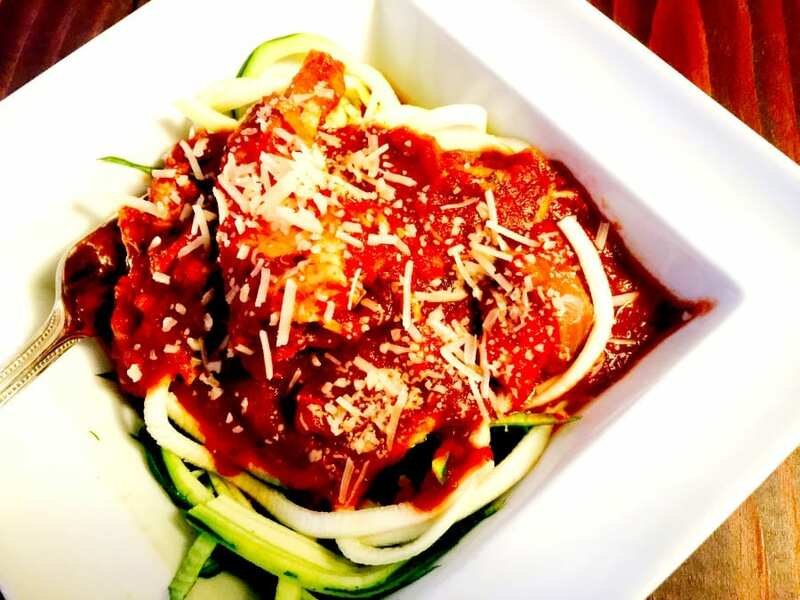 I don’t even cook my zoodles – I let them steam in the warm sauce and voila! But you can also saute them first if you want to! I am going to try to post a few more Instant Pot recipes this month, so keep checking back! Who else got one from Santa? 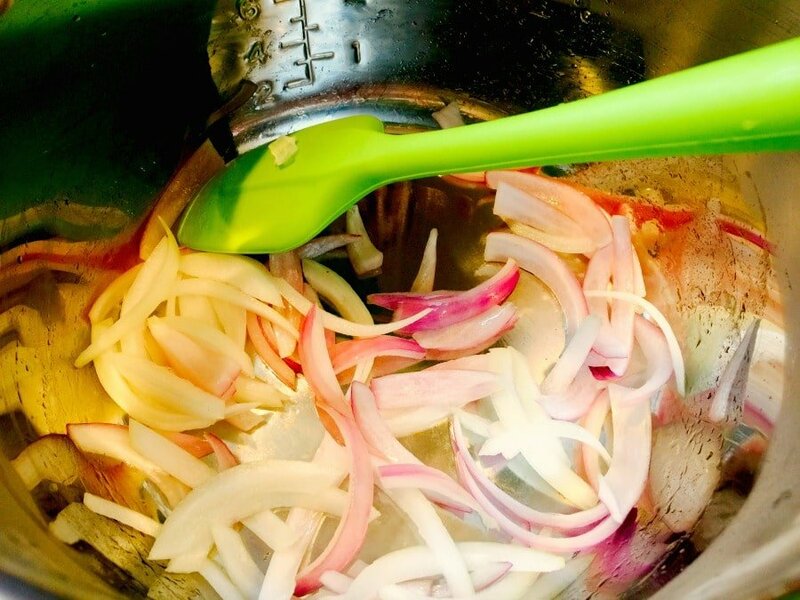 Set Instant Pot to Saute and Saute your onions until they become soft and translucent. Add in chicken and remaining ingredients, except zoodles. Set to high pressure for 10 minutes. It took about 15 minutes for my pot to come to pressure. After cook time is up, use the quick release function on your pot. Shred chicken and serve with sauce and zoodles or pasta! *I don’t even cook the zoodles – I allow it to steam in the sauce! What happens if you don’t have a instant pot? How should I make it? Do you add butter when you sauté onions? I did a little olive oil spray. Hi! When you say set to high pressure for 10 minutes…does that mean manual? 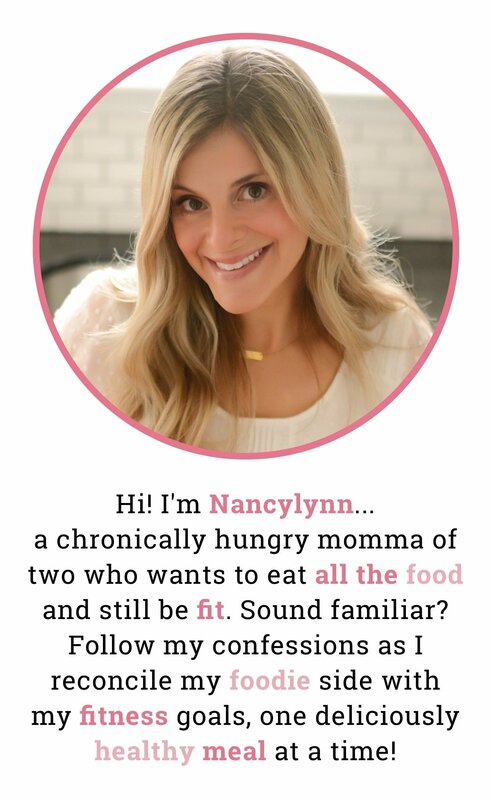 By the way, I’ve had the instant pot for many years and I’ve never used it for anything except slow cooking until I ran into your blog. Now I absolutely love the IP! Wow was I missing out! 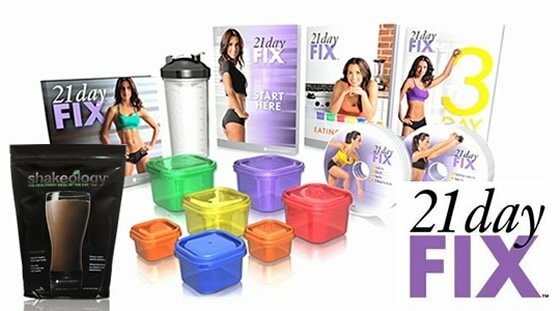 Thank you for all your IP and 21 day fix recipes!! This looks great and I plan to make. 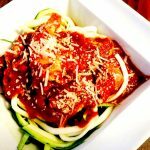 Are zoodles pre-made zucchini noodles? Those are not available at my store (living in a tiny town). I normally make my own by slicing them up. I am new to the IP. Are you saying you put the zoodles in raw after everything has cooked and you have released the pressure? Yes! Just to warm them up right before serving :). How long should I cook if my chicken is frozen? Thank you! Hey! 12 minutes should be plenty of time, unless your cutlets are super thick…then you can go up to 15 mins. 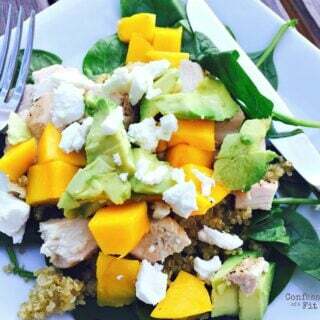 Hi, Am planning on making this tonight, if I use 4 chicken breast, should I double all other ingredients as well? Thanks! Nope! You will be fine! Do I cook it for 10 or 15 minutes? Hi! Select manual and make sure it is set to high pressure. Then cook it for 10 minutes. It will take about 15 minutes for the pot to actually heat up. Hope this makes sense! Hello! Planning on making this tonight. I saw you said to heat the zoodles in the sauce (but the pic shows the zoodles aren’t covered in Sauce). Is there a “steam” option or a basket to place the zoodles in or do you just mix them right in? Thanks! I would just mix them right in! I don’t like when my zoodles get mushy, so I feel like less cooking is better :). Hmm…I haven’t heard that before, but chicken breasts can be tricky in the IP. If you find that happens to you a lot, I would try boneless thighs! This was the first thing I made in my new instant pot and it turned out great! I swapped the chicken breasts for boneless skinless thighs and followed the directions exactly. Thank you! Can’t wait to try your other recipes! This is great, Stephanie! I love the way thighs come out in the IP! What do you mean by “make sure it is high pressure”? Making this tonight and I just set it to manual and set it for 15 minutes since I had 3 thick, frozen chicken breasts. That’s fine! There is a low and high pressure setting on some of the IPs…but you need to adjust it to low. It will default to high. I made this with a can of diced tomatoes just as it said and it did not create a tomato sauce like yours. It looked like diced tomatoes in balsamic vinegar. What did I do wrong? The photo may have been from using crushed tomatoes which is also ok, but I do find that the diced tomatoes do better in the IP. Did it taste ok? This turned out really good and is fast and easy. I used crushed tomatoes and made half the recipe with an extra large breast and it was enough for 2 servings (I wish I would have made the entire recipe and had leftovers). 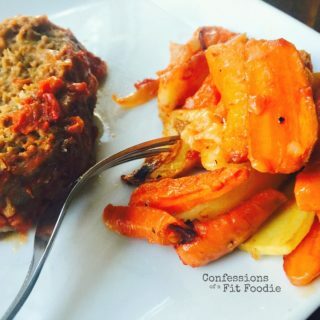 I served it with spaghetti squash and it is a perfect lower carb meal that I will add to my meal rotation. 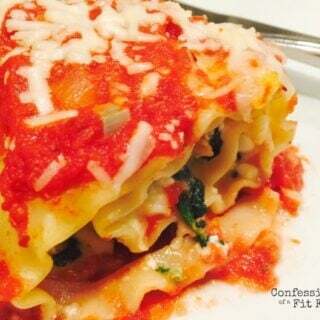 Next time I make it I will add more spices and maybe even add some spinach at the end. I started this, and before it got up to pressure (on high setting) I got a BURN notice! Anyone have any idea what I did wrong? 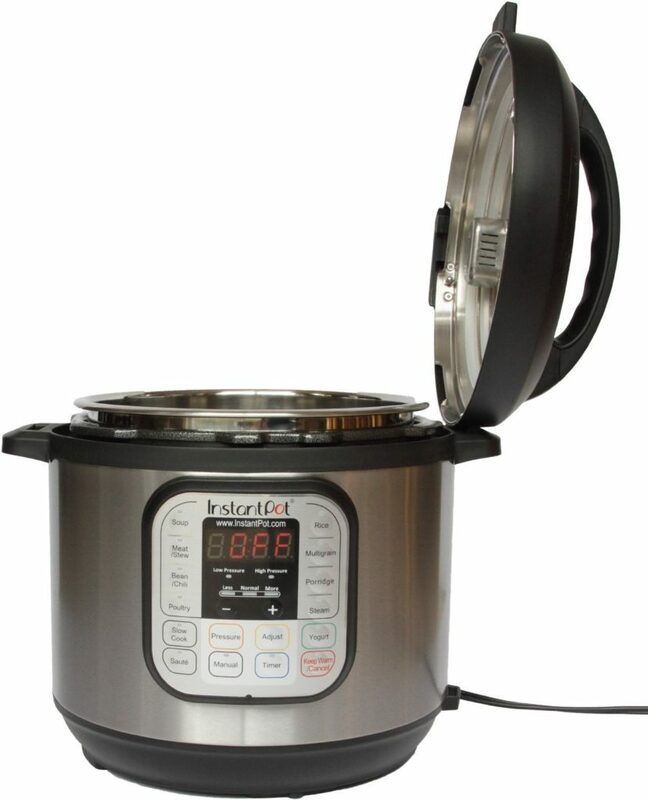 What size instant pot do you have? Did you use the crushed tomatoes or the diced? I really value the comment sections of recipes so I thought I would add my comments here. This was a successful recipe at my house. I used two 15 oz cans of diced tomatoes, 4 medium/large FROZEN chicken breasts, omitted the onion (didn’t have any) and served over rice. I cooked for 15 min on high pressure, which seems like it was perfect. I did a natural pressure release, removed the chicken into a mixing bowl and used a hand mixer to shred it. I then took the hand mixer to the sauce because my kids don’t like chunky tomatoes and my immersion blender is broken. The hand mixer helped to sorta break down the tomatoes, and we served it with a ladle to pour over the chicken on the rice. Made a side of broccoli and felt like it was a perfect dinner. It was different, in a good way. Thanks for the recipe! Odd question but would it still taste good to not shred the chicken and just eat it whole? I hate shredded chicken. If I use chicken cutlets instead of full chicken breasts, would I decrease the cooking time? Thanks!